Canon is releasing the much anticipated Canon 5D Mark III on March 2nd, a major update to the existing Canon 5D Mark II camera that was released back in 2008. 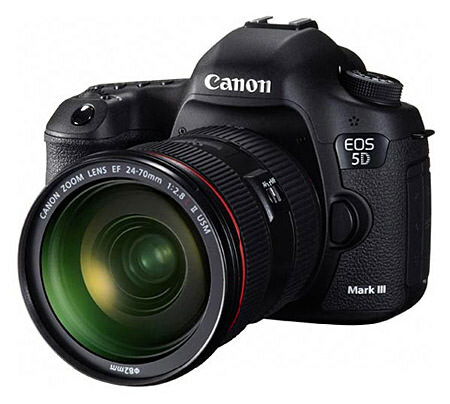 The 5D Mark III is a very interesting and appealing update, because Canon decided to keep the resolution of the camera about the same – 22.3 MP sensor, versus the 21.1 MP sensor on the 5D Mark II. This is a very different move compared to what Nikon did with its D800, which boasts a crazy high resolution of 36.3 MP, versus 12.1 MP on its previous generation Nikon D700. It almost seems like Canon and Nikon are reversing their roles, because Canon has always been pushing for a higher megapixel count, while Nikon has been focusing on better image quality, better autofocus and other important features. The Canon 5D Mark III specifications are indeed very impressive – seems like Canon is finally listening to its large customer base. The AF system went through a complete rework and the camera now has 61 focus points, up to 41 of which are cross-type. The previous 9 focus points and 1 cross-type on the 5D Mark II sound like a joke in comparison. The Nikon D4 and D800 have 51 focus points total, 15 of which are cross-type. So Canon is way ahead in terms of AF specifications (that’s assuming that Canon finally addressed its AF problems). The continuous shooting speed has also increased to 6 fps (compared to 5D Mark II’s 3.9 fps and Nikon D800’s 4 fps) and the viewfinder coverage is now 100%, compared to 98% on the 5D Mark II. There are many other new features to talk about – see the detailed specifications below. A detailed list of features will soon be available on Canon.com. For a comparison between the new and the old 5D, see my Canon 5D Mark III vs 5D Mark II article. I hope 3500$ will not turn out to be the price of 5D3. It’s hard for me to understand what justifies the 500$ difference between C and N.
I agree with Nasim, that C&N reversed their roles for a moment. But what I think is that soon (in year or so) they both will release the second camera – e.g. Nikon something with less MPx and high fps and Canon with more MPx and less fps. Then everything will be back to normal. in your opinion, which one better, 5D3 or D800? these were what I was hoping for the D800( at least spec wise). to replace my D700. Slightly more MP(would have been happy with 16-18), even better iso perfprmance(I am guessing) and 6 FPS. The D4 is way out of my price range, but the D800, photography wise-not video-just does not seem to offer more than the d700. I hope you are right that the downsampled images would give better noise handling.